Bottling companies are vehemently against it. They spent millions and millions of dollars in false advertisement and other ways to discourage Philly residents and city council from approving and having favorable opinions. As a public health person, as a physical activity person, as someone who has grown up in Philly and currently works in the public school system, as someone who lives with a corner store across the street and a park that’s half usable down the block, I 100% was and still am in favor of this tax. 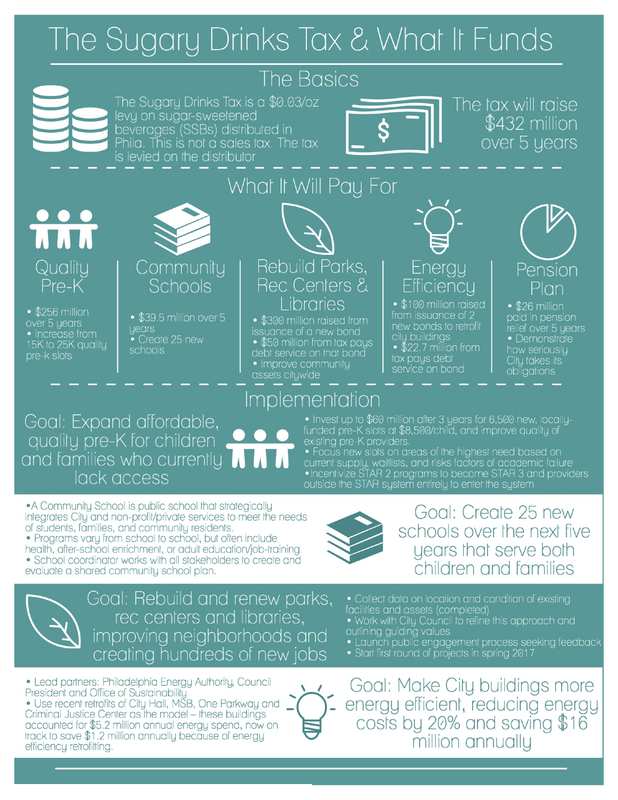 The monies from the soda tax are going towards many things- the biggest is pre-kindergarten, look at the picture above! At the same time, City Councilwoman Renyolds Brown proposed a “container tax.” Unlike the sugar sweetened beverage tax (soda tax), the container tax would tax EVERY beverage except milk. So this would include everything in the soda tax plus drinks like water, 100% fruit juice and healthy options. Why are people so vehemently opposed to the soda tax? People are claiming it’s a regressive tax which means it will target and impact low-income individuals more. Others are wary of where the money raised will REALLY go. Will the money be used correctly? I was asked to speak/testify in front of city council last week before they voted. I will leave the link below of what I planned to say. When I arrived at city council chambers, it was PACKED. Instead of starting hearings at 2, as scheduled, it started at 3:15ish, and council decided that they didn’t want to hear any testimonies on the soda tax, they only wanted to hear about the container tax. What I wrote was only about the soda tax, I tried to tweak my statement, but it wasn’t coming together and I eventually left around 4:30. Council continuously repeated that they only wanted to hear about the container tax. I didn’t feel comfortable speaking when they didn’t want to hear about the sugar beverage tax- which is what I focused on. My stance in my testimony is a public health perspective. Like I said before, I am in support of the tax. However, I do have some reservations because…how will we ensure the funds will be used for what they are supposed to be allocated for? If we are saying that this may impact the health of Philadelphians, what is in place so that the residents can make healthier decisions? Does the mayor have a task-force or collaborative unit that will work to have solutions for what will happen once the tax is imposed? What about having qualified pre-k instructors and making sure that the pre-k aspect is fully thought out and implemented? I just have questions, a bunch of concerns and questions. And although I stand in support of the tax, I understand why residents have their reservations. City Council approved a 1.5 cents per ounce, not 3 cents per ounce. 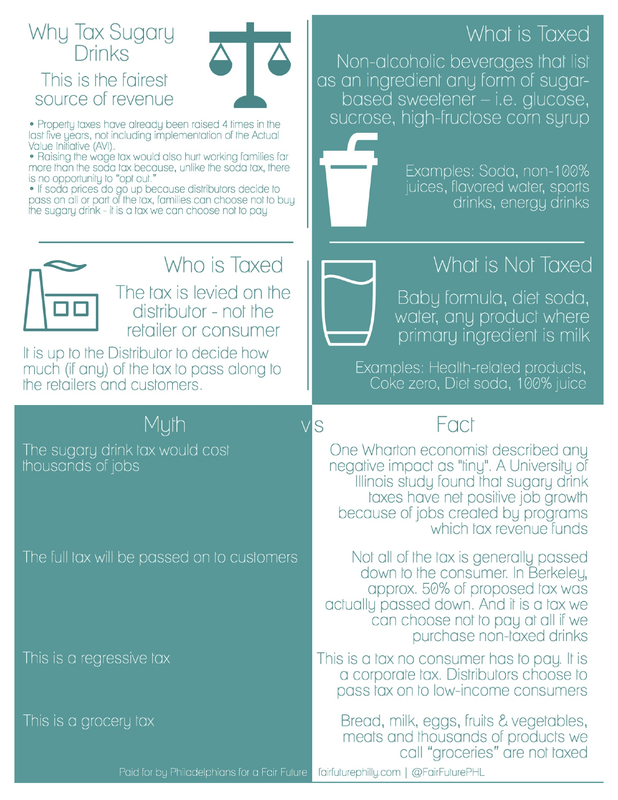 If a beverage is 50%-100% fruit juice, it won’t be taxed. I learned that by taxing diet sodas, it makes the tax “less regressive” because more affluent people drink diet beverages…interesting. There were 13 “yays” in favor for the tax. From what I heard, it was 10 resounding YES and 3 reluctant “yes” The final vote is June 16th. Everybody has something to say. What’s your opinion and why? Even if you aren’t from Philly, would you support a similar tax in your city? This entry was posted in Nutrition and tagged food justice, mayor kenney, philadelphia, pubic health, soda tax on 06/14/2016 by The Tenth Muse.